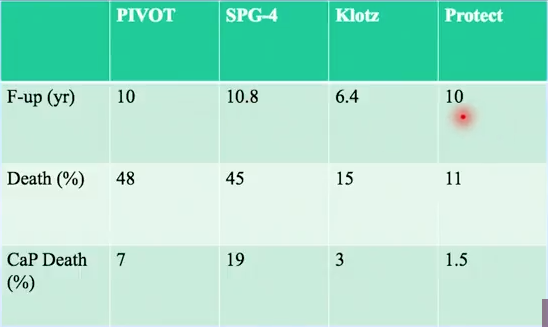 Gerald L. Andriole, MD, who served on the cause of death ascertainment committee for the Prostate Intervention Versus Observation Trials (PIVOT), discusses PIVOT and criticisms to the trial design. He then analyzes similar trials testing definitive versus non-definitive treatment in low-risk disease. In 2012, The New England Journal of Medicine published the randomized trial PIVOT. It tested whether or not the intent to treat with radical prostatectomy (RP) in men with screen-detected, clinically localized prostate cancer reduces mortality compared to observation. They published a follow-up article in 2017. Notably, the inclusion criteria required patients to have a PSA value of less than 50 ng per milliliter. Also, patients had to have had a predicted life expectancy of 10 years or longer. Results showed that surgery did not reduce mortality in men with low PSA or low-risk prostate cancer. This observation, in conjunction with other trials, has increased urologists’ and patients’ awareness and acceptance of surveillance. On the other hand, PIVOT results support that surgery is likely beneficial for men with higher PSA and/or intermediate risk disease. However, the PIVOT trial had many limitations. Patient volunteers most likely had a higher severity of disease than in most RP series. Sextant biopsy determined the diagnoses for most of the patients in this trial, so some men considered to have low-risk disease likely harbored undiagnosed Gleason 4 pattern elements. Furthermore, the trial design required 2000 patients, but only included 731 patients. Therefore, this trial was too underpowered to result in quality data. Issues with crossover and noncompliance may have diluted the trial results, as well. Additional randomized trials comparing definitive versus non-definitive treatment in early prostate cancer include The Scandinavian Prostate Cancer Group Study Number 4 (SPCG-4), the Prostate Testing for Cancer and Treatment (ProtecT) trial, and the Long-Term Follow-Up of a Large Active Surveillance Cohort of Patients With Prostate Cancer (led by Laurence Klotz, MD, FRCSC). The graphs below compare baseline characteristics and results of these three studies and PIVOT.